We’ve made it to our final ruler work lesson, kind of a bittersweet moment. I hope this has been a fun and educational experience for you! 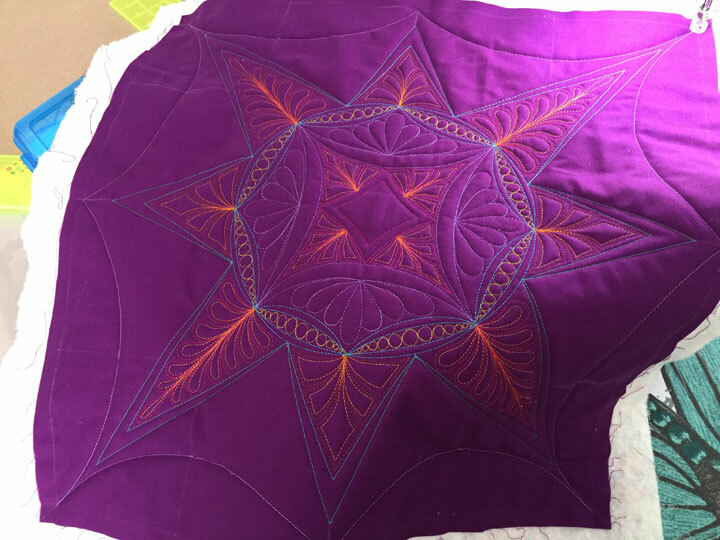 Learning to do ruler work has really breathed new life into my own free motion quilting and if I’ve infected you with this same enthusiasm, I’ve done my job. Next, ensure that all your soap lines from the original 8 lines we marked at the very beginning of lesson #7 are still visible. If they’re not, darken them again as you’ll need to “play off those lines” in today’s lesson. I bring this up because we are doing the same thing here. The marked sandwich looks a bit different because we’re working off a soap line base now and our arched swags are shallower and wider than what we made in lesson #4, but this is exactly what we did before. 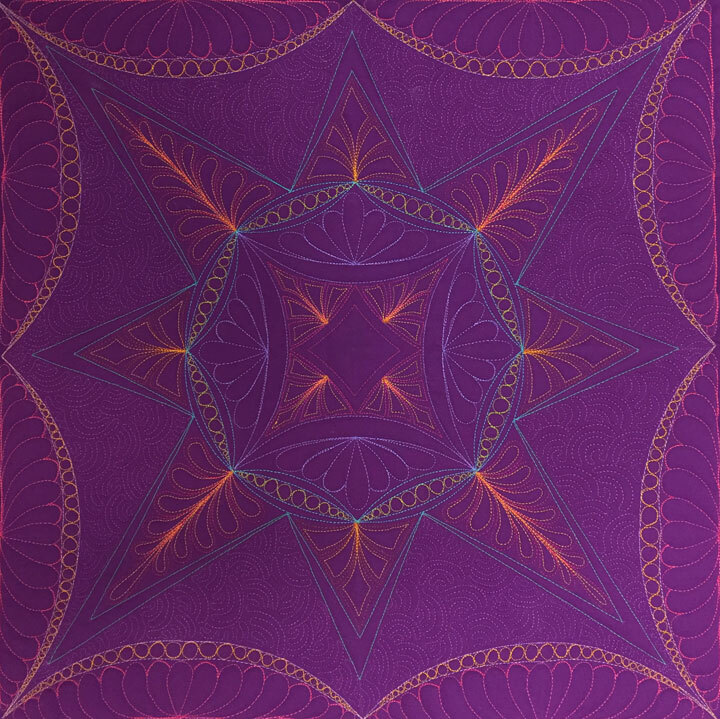 Remember, in ruler work, we are really doing the same things over and over again, but we are changing our starting and stopping points, and we are altering orientations, but we are essentially just creating parent shapes followed by channels. Understanding the simplicity in this will help give you the confidence to create beautiful and intricate ruler work designs going forward. Before we move on, I need to point out something important. These arched swags that frame our center design are very long, and we have really maxed out the length of the PTD12 arc ruler to create them. You know because if you look at the photo above, you can see that the centers of each arched swag aren’t quite as “smooth” as what we want them to be. (In truth, the “wonkiness” of this is accentuated in the photo because there are small chalk lines at each center point that make things look worse.) This won’t be so noticeable once I’ve erased the chalk lines and filled in the tapered channel, but I don’t want to pass up this opportunity to let you know about this phenomenon. What do you do when you want to frame something but the longest arc ruler you own is actually too short to create the framing above? The answer is actually pretty easy…create a framing design that involves more than 2 sections! In other words, subdivide this expanse into more subdivisions as each subdivision would then require a much shorter expanse of an arc ruler. I didn’t do that here because this is your very first framing experience so I wanted to keep it simple, but know that there is almost always a work around to accommodate the rulers you have at hand. When those options don’t seem as aesthetically pleasing to you, that’s when you break down and buy more rulers! This kind of gets back to what I said when we first started playing with arc rulers; these are very, very versatile “design makers,” so it really pays off to accumulate as many different arc rulers as possible. One manufacturer’s 12 arc is different from another manufacturer’s 12 arc ruler, etc., etc, so it’s easy to accumulate a large variety of curves over time. This marks the end of our ruler work journey. These lessons are an effort to pass along some of the concepts and skills that guide my own ruler work designs. These lessons are meant to be much more than a few specific design lessons, so don’t fall into the trap of seeing them as just that. 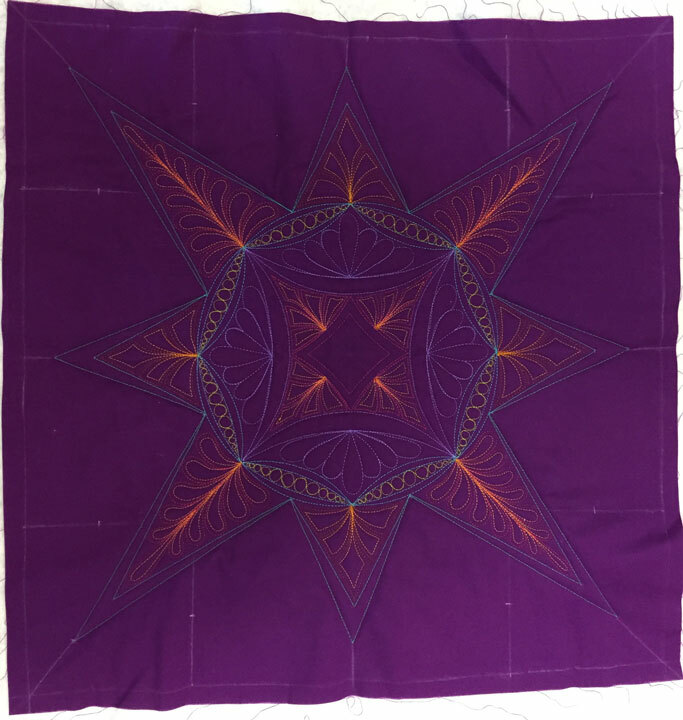 Know that if you can allow yourself the freedom to dream about using these basic concepts in other layouts, there will be no end to what you’ll be able to quilt with rulers. 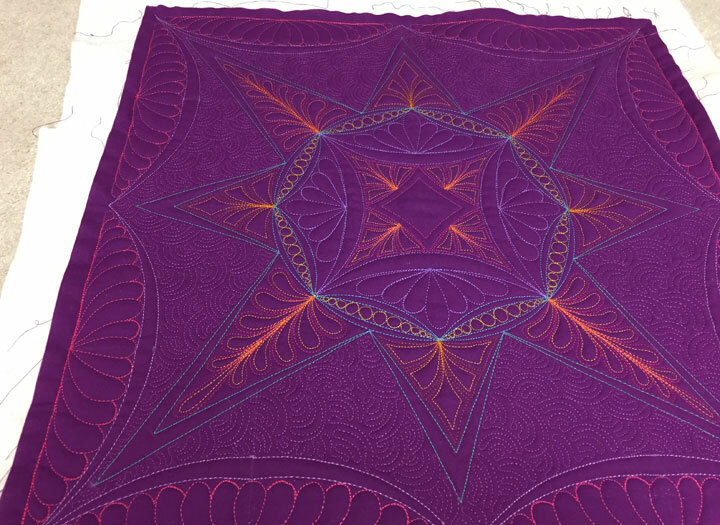 If you don’t believe me, scroll backwards in my blog to view old posts about how I’ve been quilting more complex designs and you will probably now understand how I do most everything I create! If you are ever stumped about how to make something, come back and re-read lessons 1-6 as these really are the concepts from which everything I create evolves. 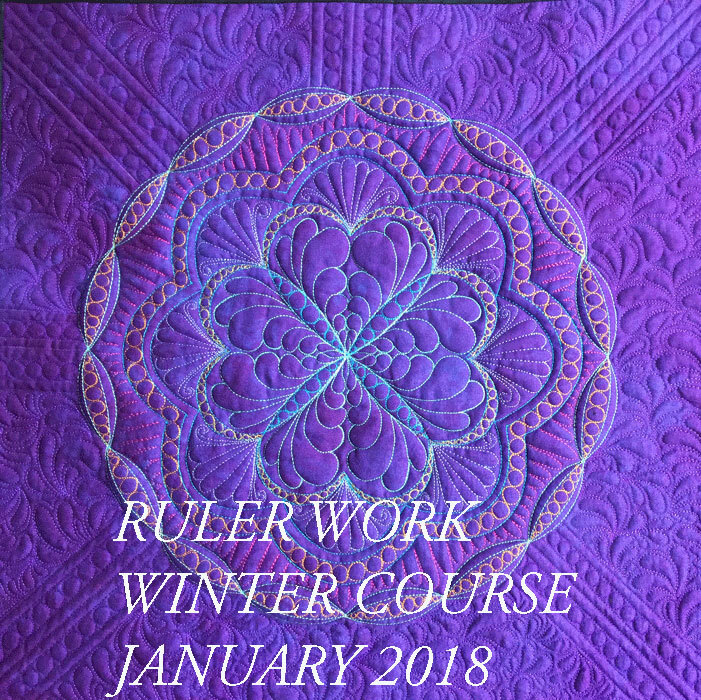 If you’re looking for even more inspiration, be on the lookout for our new DVD called “Ruler Work for the Sit-Down Quilter Volume 2,” which will hopefully be available in late winter. I hope you’ll stop by my blog regularly. Although I won’t be posting a series of coordinated lessons, I have always (and will continue) to use this blog as a place where I post details about what I’m making and how I’m doing it. It has been a real pleasure to hear from so many people all over the world who are sharing the same love of ruler work that I have. I’ve been scratching my head, wondering why it took us home machine quilters so long to figure out how to enjoy the ruler work that long arm quilters have been using for decades! 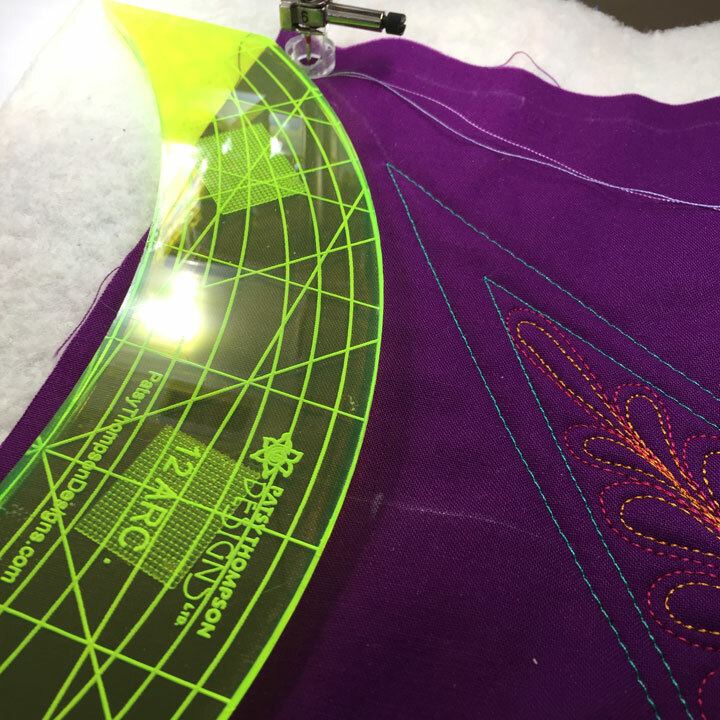 I guess it doesn’t matter now that we know how to do it, but it gives me hope that someone out there is probably on the verge of discovering the next fun thing we quilters can do with our sewing machines! Have a great day and stay in touch! Patsy, thank you so much for these lessons. I have learned so much. I am not so proficient with the fmq’ing so I am trying to discover more filler designs that I can do with my rulers. I do love the Aztec feathers because I can use my ruler. I love the pearls but just cannot master them. I will continue to practice and come back to your blog for more inspiration. First I want to thank you for all your awesome work. I’ve been following you, but at times sporadically. Is there a way to catch up? Just found it! I was searching late last night and hadn’t found it, so that’s why I asked this morning! I feel a little foolish here. Patsy, thank you so much for how you have enriched my understanding of quilting. I first ran into some of your work last summer on the youtube videos and have searched out a lot of your library to learn more. I truly love your colors and designs! You have really inspired me to pursue quilting more seriously. Hi Patsy. I am still waiting for my rulers to arrive… I have the basic design marked out but did not want to start the stitching without the proper rulers. I managed the first few lessons with some rulers that I had but without the same arcs. I like the way your designs look and want mine to be as good as possible. 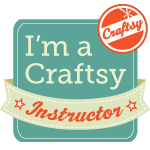 I have both of your craftsy classes and learn so much from them and this series of lessons. Thank you for all of your efforts on our behalf. Hi Jo-Ann, I sent an email to you privately with the details of your order. You live outside the US so delivery will always take longer as the package is traveling farther and also must pass through customs. Your order was literally shipped 1 hour after it was placed in our store. Your order was shipped 7 days ago (4 business days), so it does not surprise me that you have not yet received it. I included all the tracking info in the private email I sent to you. 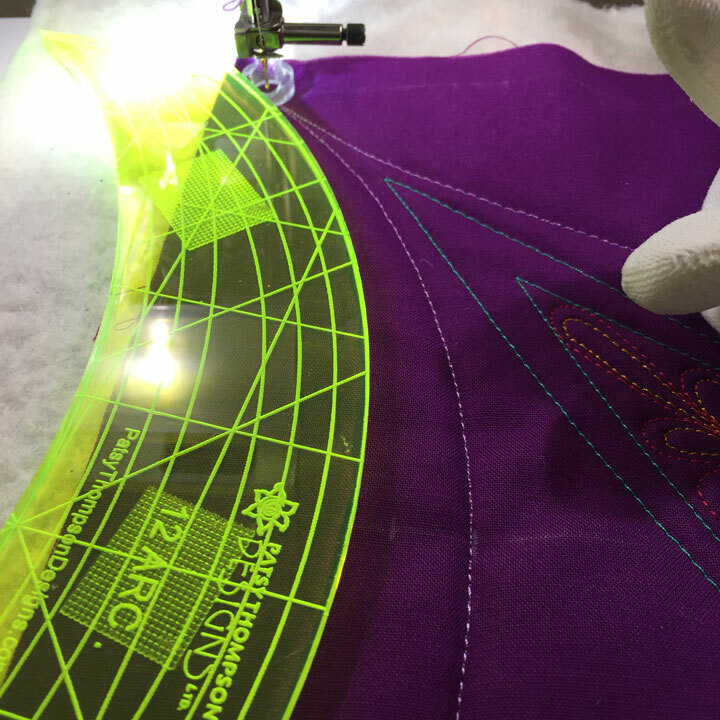 I understand your desire to get stitching, but some things just take time! Patsy, thank you so much for these ruler lessons! 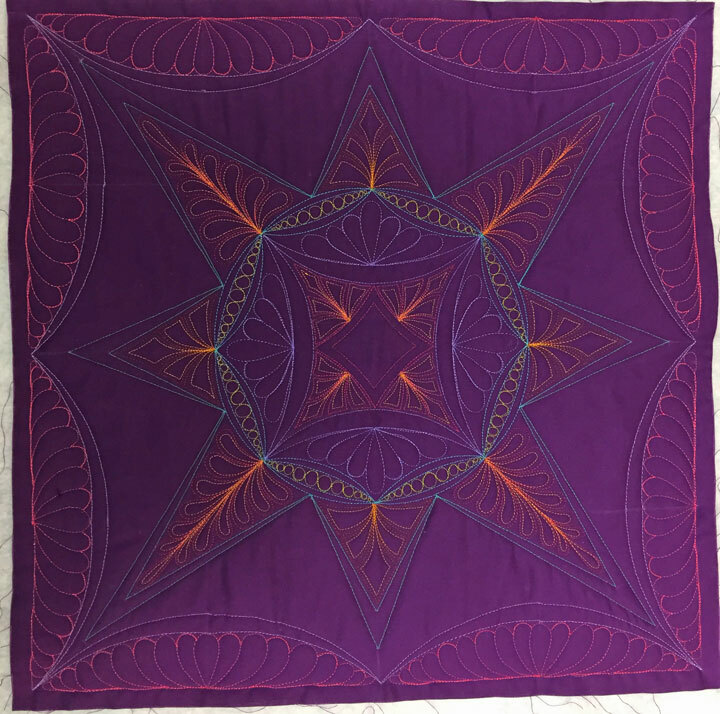 I have learned so much and will continue to practice and use your techniques in my free motion quilting. Love, love, love all that you put into this to show us that it can be broken down into manageable pieces and end up with a beautiful work of art! Thank you so much for a wonderful class. You are a great teacher! Many, many thanks once again Patsy. You have brought some much needed sunshine to a cold and dull January. Great class! Patsy, thank you very much for the time it took you to bring this wonderful class to us all. I have very much enjoyed this along with your Feather class on Craftsy. Keep encouraging us in the future. I truly appreciate these lessons too, Patsy. I wish they wouldnt have to end; but grateful for what you have generously shared with us. I looked at your craftsy classes and will watch them, but it is over my head, as i am ruler dependent. My free motion skill is not yet developed. 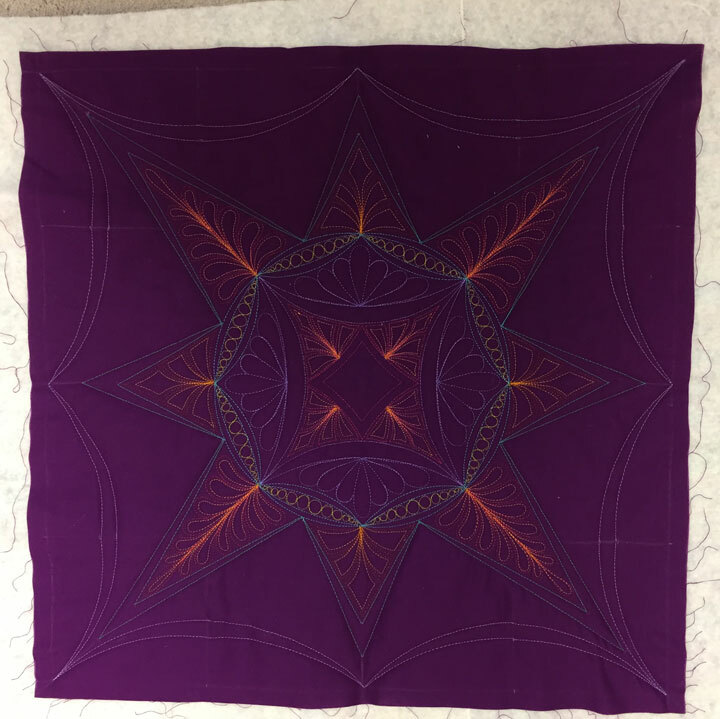 I want to ask: would you clarify again about your method of hyperquilting … do you stitch it with the thread you’re using, then go back and stitch around it or on it with a bright thread or do you just stitch it with a brighter thread that makes the area glow? This has been such a wonderful series of lessons. Thank you for taking the time to share. You’ve certainly helped me loads. And, I’m thrilled that you will soon be releasing a new DVD on ruler work. Very exciting news. Thank you so much Patsy for these lessons and the time you have taken to answer questions. Your explanations are so clear, and you are able to break down the most complex of instructions into easy to manage and understand steps. I have your first DVD on ruler work and am eagerly awaiting the second. Your time and generosity are greatly appreciated. Thank you. These lessons have been fantastic! Do you use a specific brand of thread that makes the piece look “luminous”, and what weight thread do you use? Thanks, Patsy, as always, you have presented a great set of directions. Thank you so much Patsy for these wonderful lessons! I have learnt so much and can’t wait to use these techniques in my own designs. You have given me so much confidence in using rulers! Thank you, thank you, thank you!!!! Thank you so much Patsy, I really enjoyed these lessons and learnt a lot. Still have to finish the last two lessons but am looking forward to just experimenting and putting into practice what we have learnt. I think I am hooked on ruler work…so much fun and the design possibilities are mind-boggling. Add my thank you to all the rest Patsy. This class has opened more doors for me as well. Your rulers are a great addition and much better than my basic set. Also your craftsy classes are wonderful as well. Again thank you. as I was reading each lesson, it was your voice I was hearing in my head. You have had a profound effect on my quilting and I am forever grateful! I am not using one brand of thread; it’s the types of thread that are catching your eye. 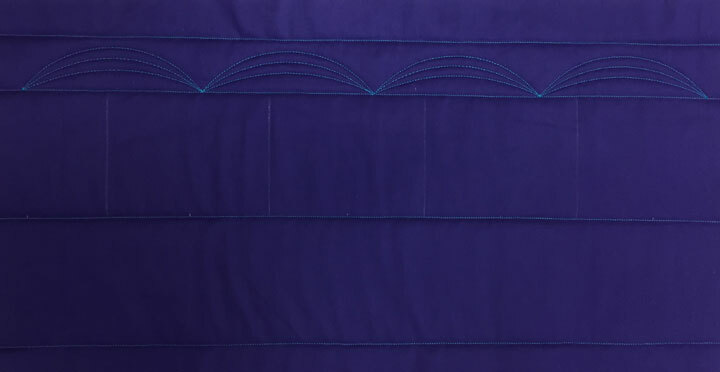 I never quilt with cotton thread because it has a flat, or matte finish. I always quilt using either a type of filament polyester (NOT spun polyester) or a rayon thread. I use these threads because they have a wonderful sheen to them and that sheen catches the viewer’s eye and really highlights the quilting. Thanks so much for this series! I learned a lot. I also note that in spite of imperfections in my piece, the over all design still looks attractive. The framework creates order and on first glance, without a detailed examination, the eye sees the overall intended pattern. Very pleased! 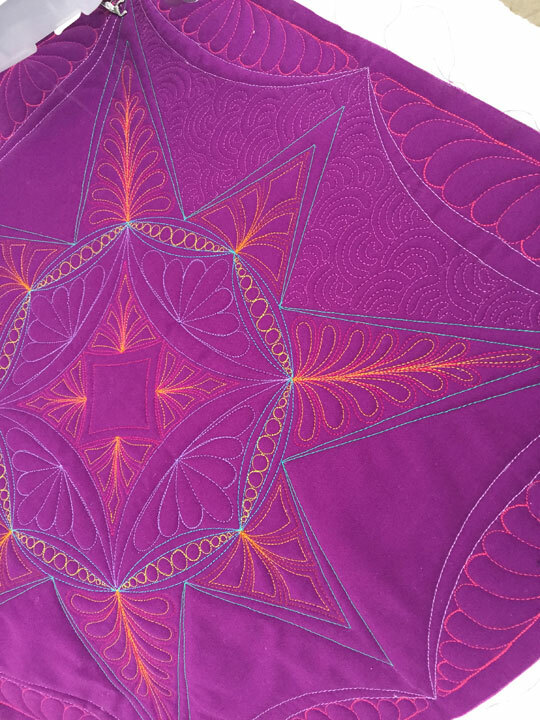 Patsy, I am so grateful for your assistance and guidance in my quilting journey. You have expanded my FMQing horizons, and kept me company while I dreadmill … :). I thoroughly enjoy your DVDs and look forward to your future creations. Thanks so much for this wonderful experience! I’ve been working on improving my FMQ skills and ruler work and this has been so helpful to me. I especially appreciate the experience of marking the fabric and considering the design. Not sure I can do that without you but I’m a step closer! Thanks so much for your time and expertise. I appreciate you so much! Where do I find the first lesson. New to the site but my searches don’t seem to be finding it? Thanks Patty. This has been a wonderful set of lessons! Thank you so much for putting this all together and for your excellent, clear instructions! I have loved learning so much at each step along the way. Love your ruler set and your Craftsy classes as well! Thank you again! !